Prof. Katherine A. Kim gave a seminar entitled “Enabling Solar Photovoltaic Energy for Wearables and Internet of Things (IoT) Applications” at National Ilan University, Yilan, Taiwan. Prof. Kim was invited by Prof. Yu-Chen Liu of the Electrical Engineering Department of National Ilan University. Prof. Katherine A. Kim attended the International Symposium on Computer, Consumer and Control (IS3C) on December 6-7, 2018, sponsored by National Chin-Yi University of Technology in Taichung, Tawan. 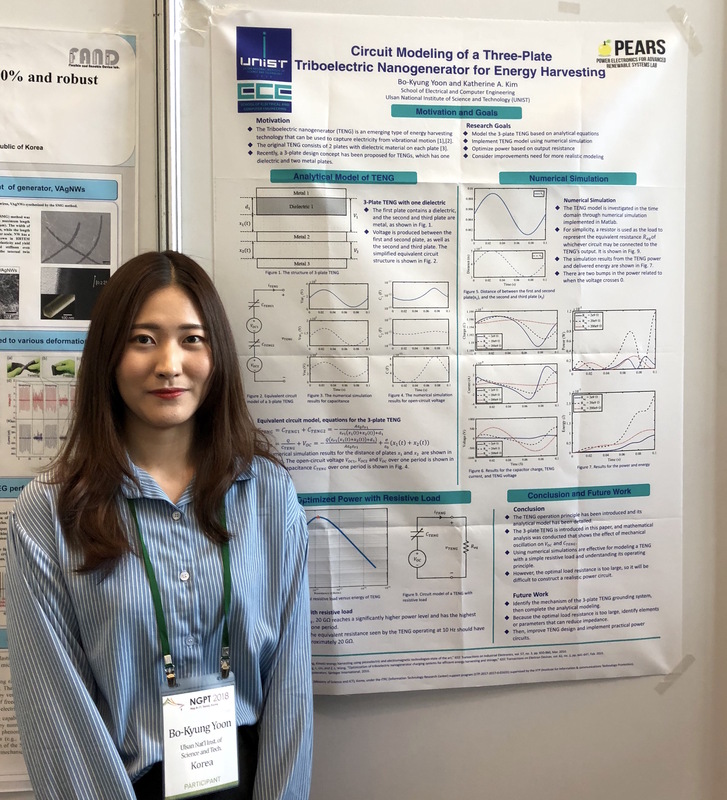 In place of her student, Hyeun-Tae Cho, who already graduated, she presented their paper on “Short-Primary Linear Induction Motor Modeling with End Effects for Electric Transportation Systems”. Prof. Katherine Kim and graduate student Hoejeong Jeong attended the Symposium on Semiconductor Power Conversion (S2PC) in Jinju, Korea on November 2-4, 2018. 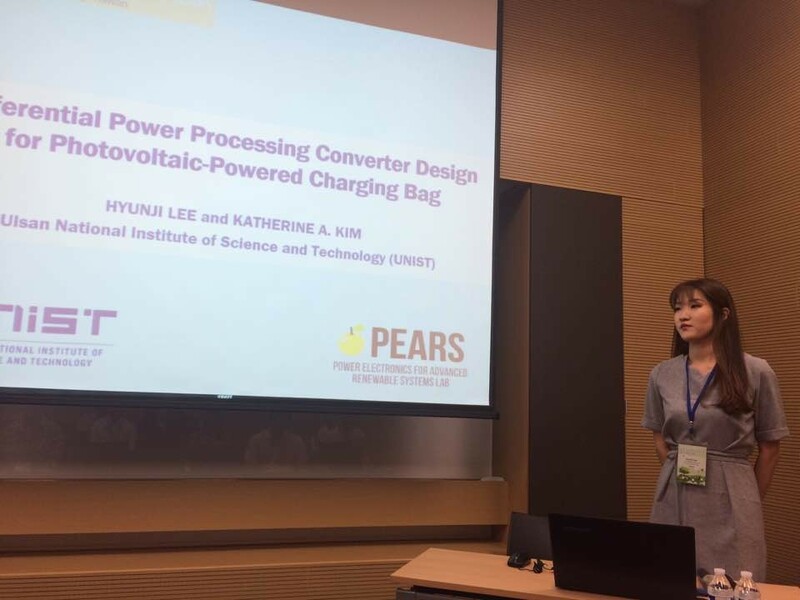 On November 3, 2013, Hoejeong Jeong presented a poster on “Structure of Segmented Differential Power Processing System for Photovoltaic Applications” during Poster Session I.
Prof. Katherine A. Kim was elevated to IEEE Senior Member, within the Institute of Electrical and Electronics Engineers (IEEE), in July 2018. For IEEE Senior Member grade, the applicant can self-nominate or be nominated by someone else. If you have over 10 years of professional experience (graduate school counts as professional experience) and have significant performance over 5 years (usually as a professor or engineering professional), you can apply. Prof. Kim is most active in the IEEE Power Electronics Society (PELS). She served as the IEEE Power Electronics Society (PELS) Student Membership Chair in 2012-2013, PELS Member-At-Large for 2016-2018, and PELS Women In Engineering Co-Chair in 2018. Starting from 2017, she became an Associate Editor for the IEEE Transactions on Power Electronics. Prof. Kim plans to continue contributing to the Power Electronics field through her research, educational videos, and service to the power electronics community. She would like to thank all her advisers and mentors through the years for their guidance and support. Prof. Katherine Kim and undergraduate intern Bo-Kyung Yoon attended the International Power Electronics Conference (ICPE 2018-ECCE Asia), May 20-24, 2018, in Niigata, Japan. 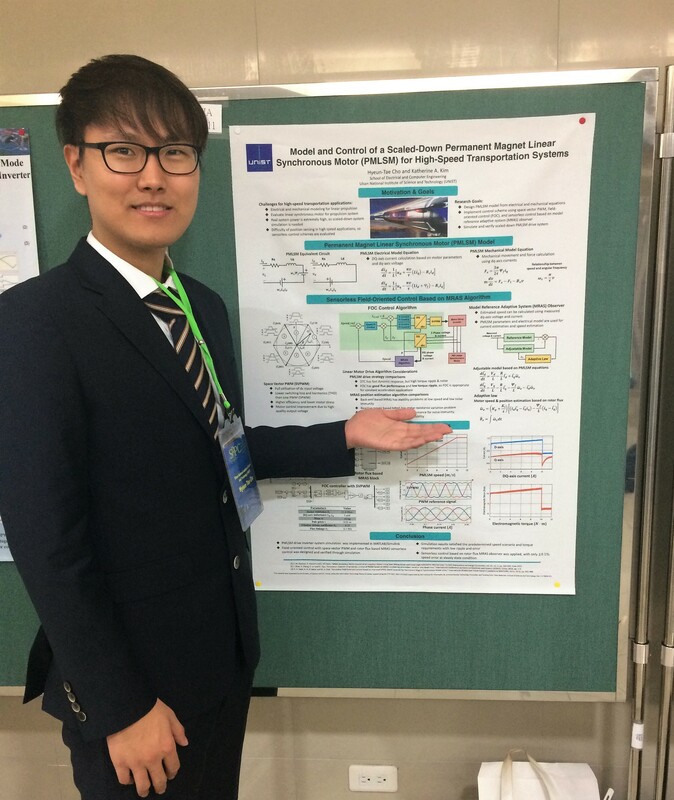 Bo-Kyung Yoon presented a poster on “Circuit Modeling Approach for Analyzing Triboelectric Nanogenerators for Energy Harvesting” on Wednesday, May 23, 2018. 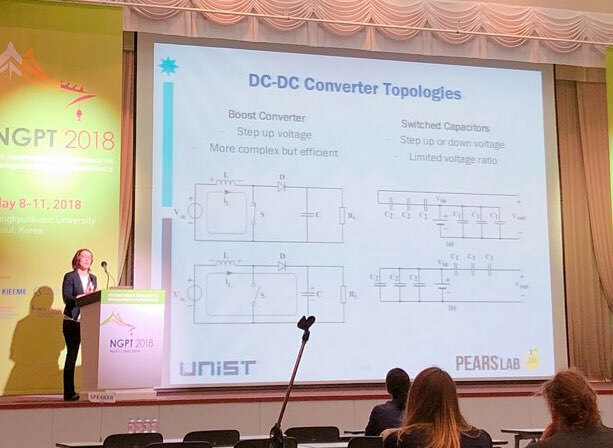 Also, Bing-Siang Huang from National Taiwan University of Science and Technology, Taiwan, presented a collaboration paper on “Design and Implementation of a High Power Density Active-Clamped Flyback Converter” at the High Performance Power Converters session on Wednesday, May 23, 2018. Prof. Kim also served as a session chair for session “23G4 Renewable Energy and Storage Applications” and “21B2 Dual Active Bridge Converters” at ICPE 2018-ECCE Asia. All attendees enjoyed the excellent conference and delicious Japanese food. 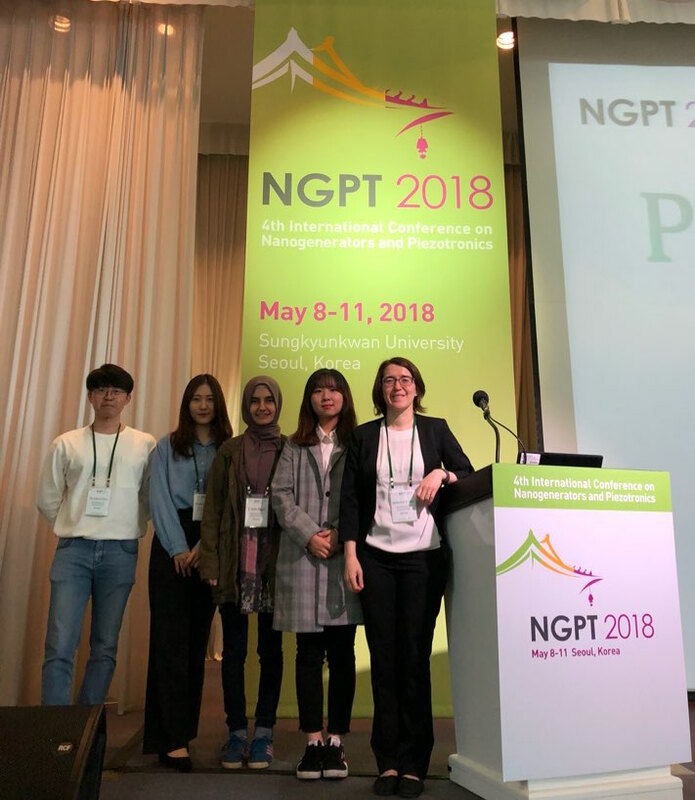 Prof. Katherine Kim, Bo-Kyung Yoon, and PEARS Lab members attended the International Conference on Nanogenerators and Piezotronics (NGPT), May 8-11, 2018, in Seoul, Korea. Prof. Kim Co-Chaired a Technical Session on “Piezotronics/Tribotronics for Sensors, MEMS and NEMS 1” on Thursday, May 10 and gave talk entitled “Implementation Considerations for Low-power Energy Conversion Circuitry in Triboelectric Nanogenerator Energy Harvesting Applications” on Friday, May 11. 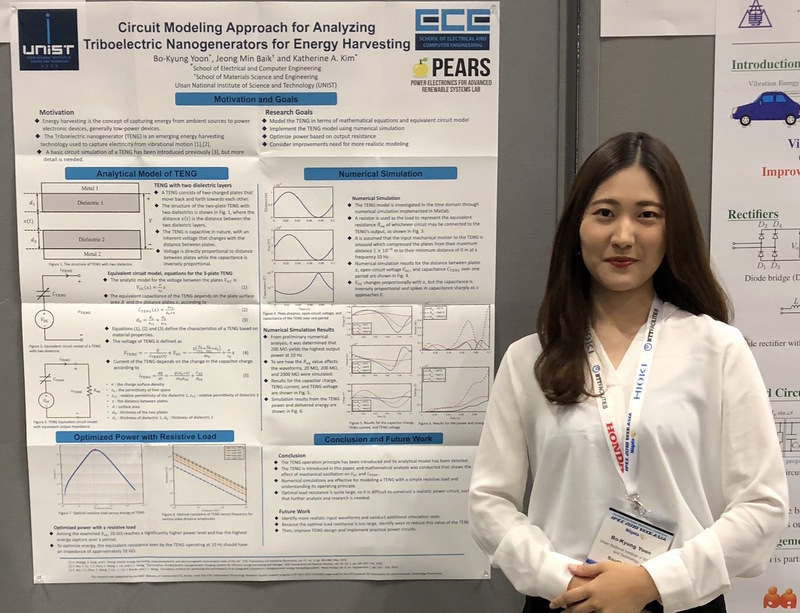 Undergraduate intern Bo-Kyung Yoon presented a poster on “Circuit Modeling of a Three-plate Triboelectric Nanogenerator with Ground System for Energy Harvesting” on Friday, May 11. Attending NGPT 2018 was a great opportunity to learn more about transducers and better understand how to develop better power circuitry for energy harvesting. 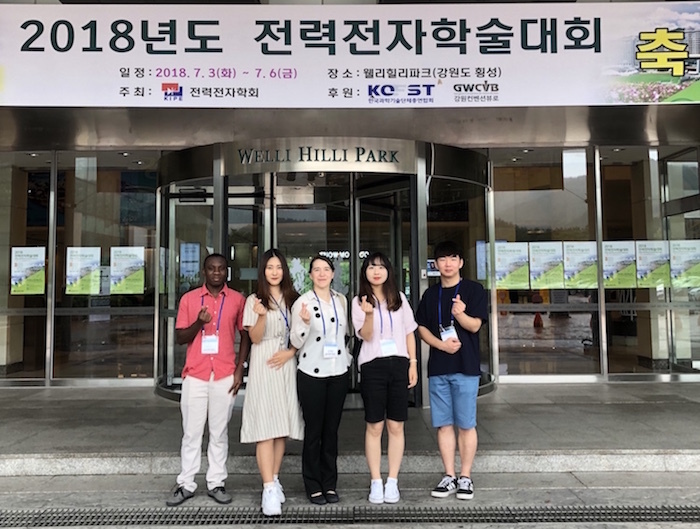 Prof. Katherine A. Kim and undergraduate student intern Bo-Kyung Yoon attended the IEEE Seoul Section Student Paper Contest 2017 at Hongik University, Seoul, Korea. Bo-Kyung presented her paper on “Circuit Modeling of a Three-Plate Triboelectric Nanogenerator for Energy Harvesting” at the competition (picture below). As one of the few undergraduate students in the competition, she presented and took questions on her research at the same level as the graduate students in the competition. A job well done. Prof. Katherine Kim attended the Asian Conference on Energy, Power and Transportation Electrification (ACEPT) in Singapore on October 24-26, 2017. On Wednesday, October 25, Prof. Kim served as the session chair for “Parallel Session 5: Microgrid and Smart Grid (MGSG).” On Thursday, October 26, Ph.D. student Kai-De Chen from National Taiwan University of Science and Technology (NTUST) presented the paper entitled “Output Double-Line Frequency Ripple Reduction Method for High Power Density Interleaved Boost Converters in Power Factor Correction Applications,” which is a collaboration paper with PEARS Lab. 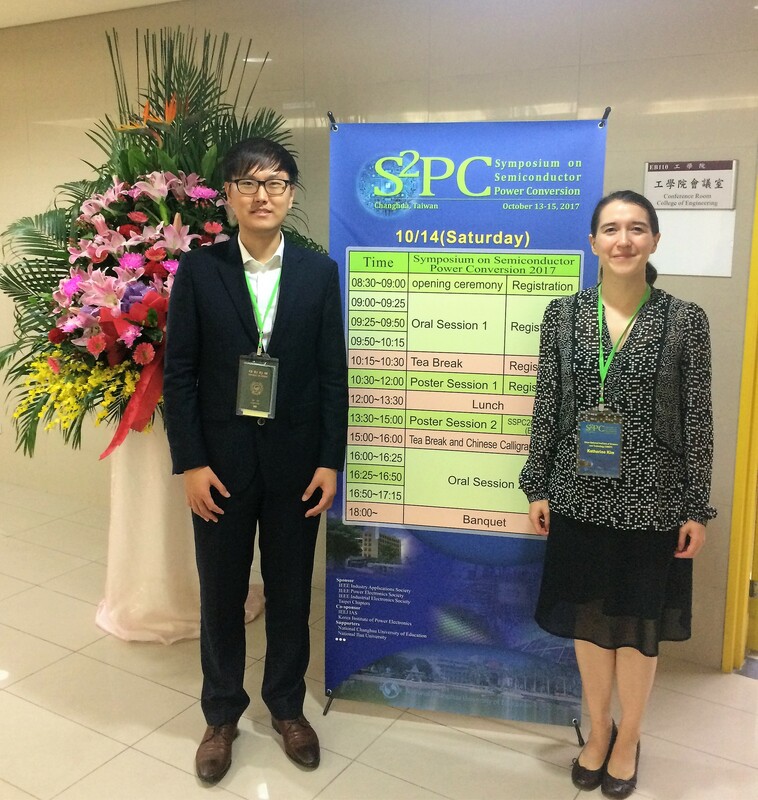 Prof. Katherine Kim and graduate student Hyeun-Tae Cho attended the Symposium on Semiconductor Power Conversion (S2PC) in Changhua, Taiwan on October 13-15, 2017. 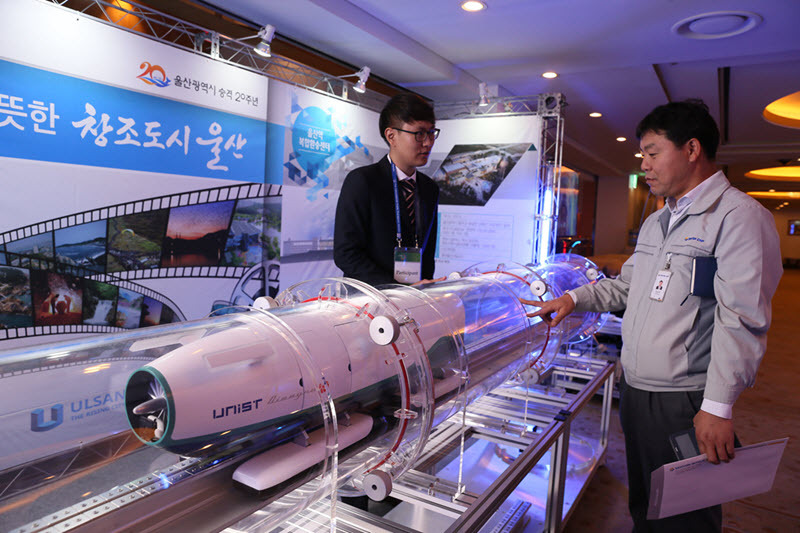 On October 14, 2017, Hyeun-Tae Cho presented a poster on “Model and Control of a Scaled-Down Permanent Magnet Linear Synchronous Motor (PMLSM) for High-Speed Transportation Systems” during Poster Session I (A). Prof. Katherine Kim was a Session Chair for Oral Session II. 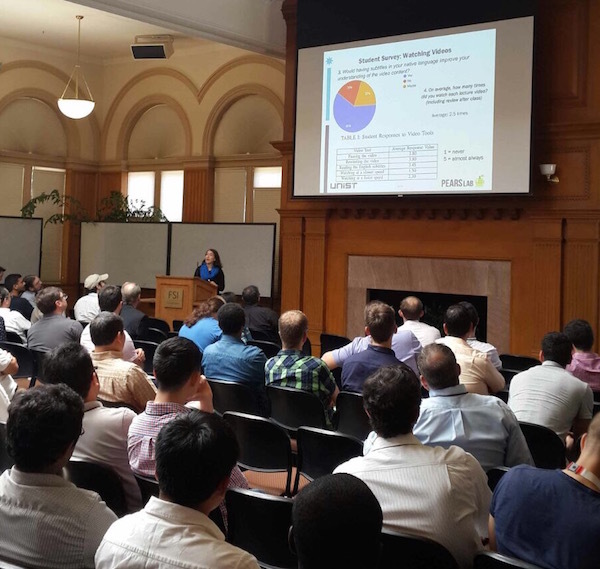 Prof. Katherine Kim attended the IEEE Workshop on Control and Modeling for Power Electronics (COMPEL) 2017 in Stanford, CA, USA, on July 9-12, 2017. 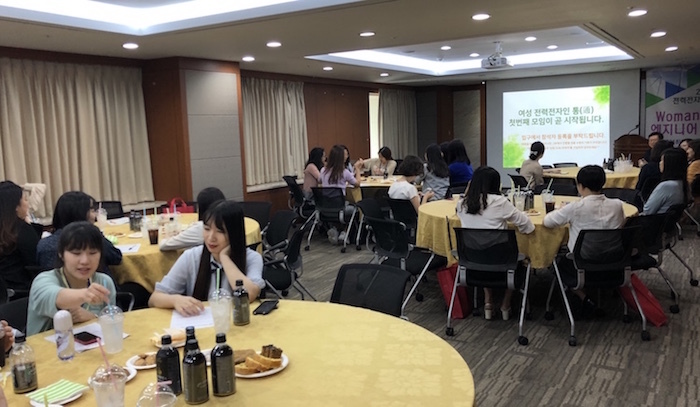 She was honored to give a talk on “Perspective on Developing Educational Lecture Videos for Power Electronics Courses” on July 10 (see picture below). 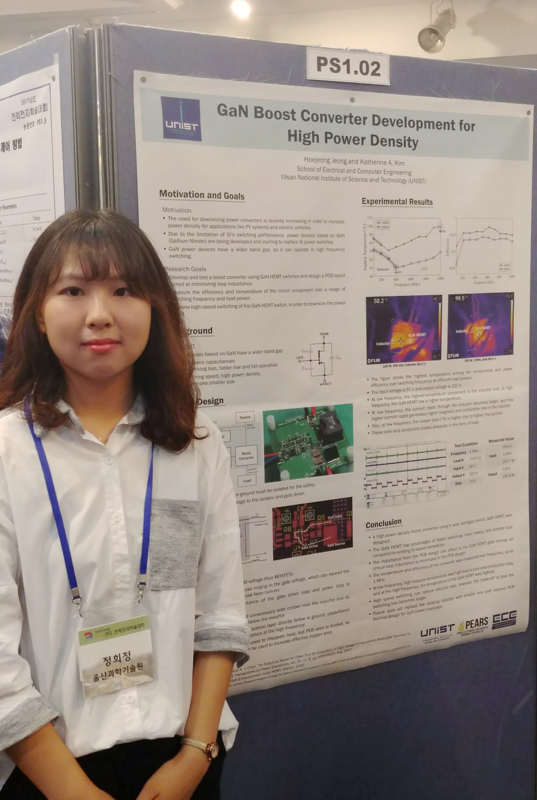 Hoejeong Jeong presented a poster for the paper entitled “GaN Boost Converter Development for High Power Density” on July 4, 2017. 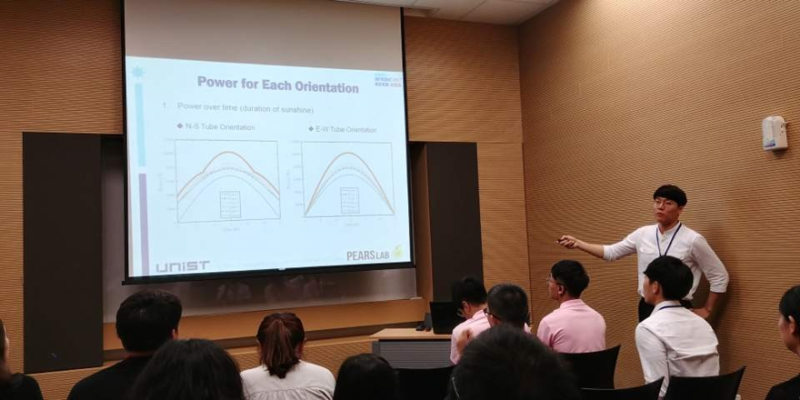 Hyunji Lee presented the paper entitled “Comparison of Two Parallel Differential Power Processing Configuration” on July 5, 2017. 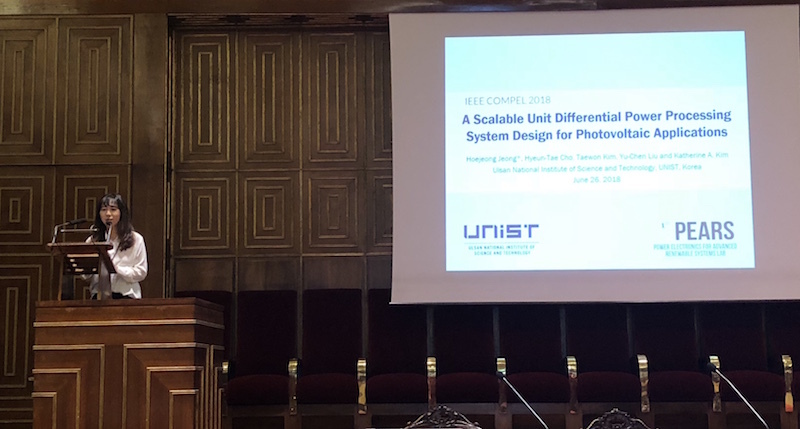 Kyoungjun Kwon presented the paper entitled “Photovoltaic Panel Orientation Study for Tube-Enclosed Transportation Systems” on July 5, 2017. 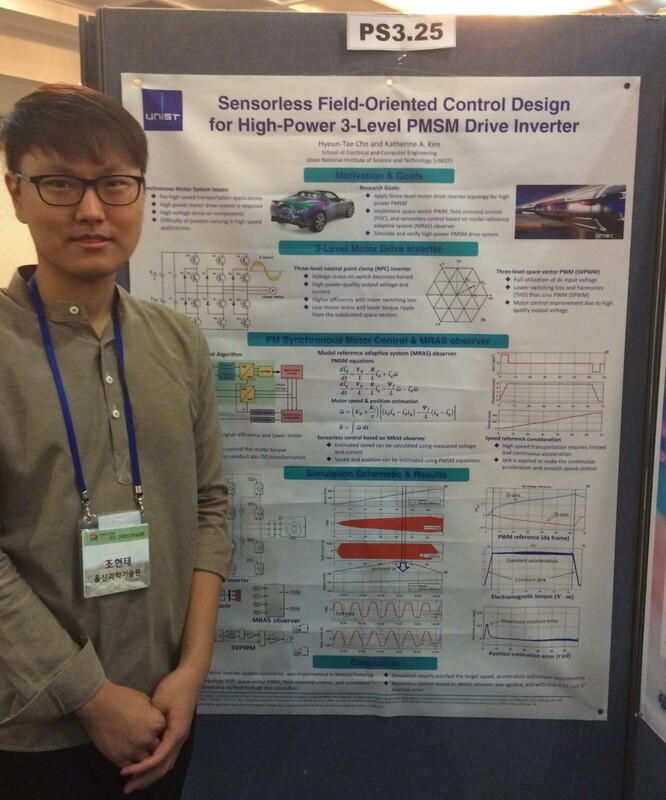 Hyeun-Tae Cho presented a poster for the paper entitled “Sensorless Field-Oriented Control Design for High-Power 3-Level PMSM Drive Inverter” on July 6, 2017. 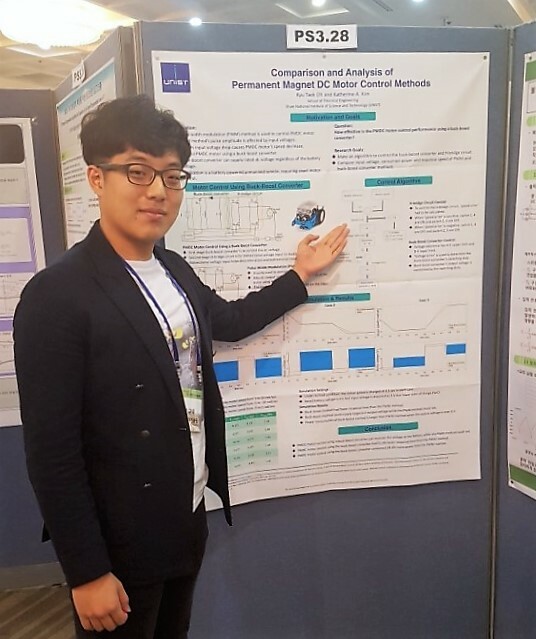 Kyu Taek Oh presented a poster for the paper entitled “Comparison & Analysis of The Permanent Magnet DC Motor Control Method” on July 6, 2017. Prof. Jun Moon (PI) and Prof. Katherine Kim (Co-PI) were honored to receive one of the 2016 Republic of Korea Science Technology and Research (ROKST&R) Projects from Lockheed Martin. The project research topic is on “Optimal Distributed Control of Unmanned Vehicle Groups.” More information on the ROKST&R projects can be found here. 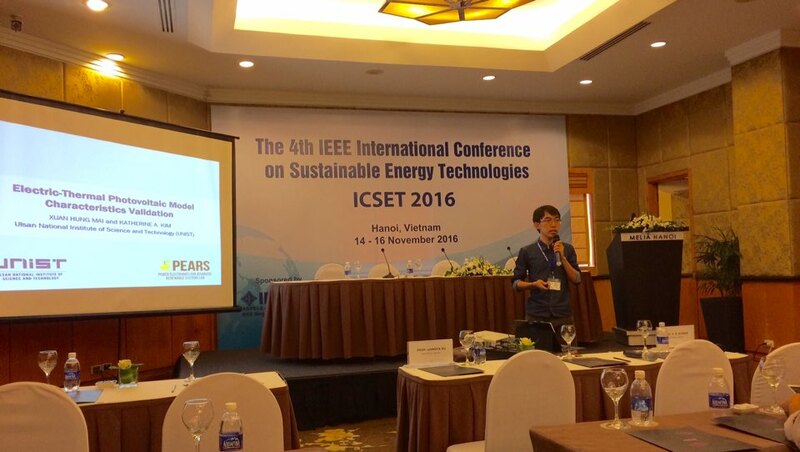 Prof. Katherine Kim and graduate student Xuan Hung Mai attended the IEEE International Conference on Sustainable Energy Technologies (ICSET) in Hanoi, Vietnam on November 14-16, 2016. Xuan Hung Mai presented a poster on “Electric-Thermal Photovoltaic Model Characteristics Validation” on November 15 in the Photovoltaics and Solar Thermal Technical Session (see photo below). 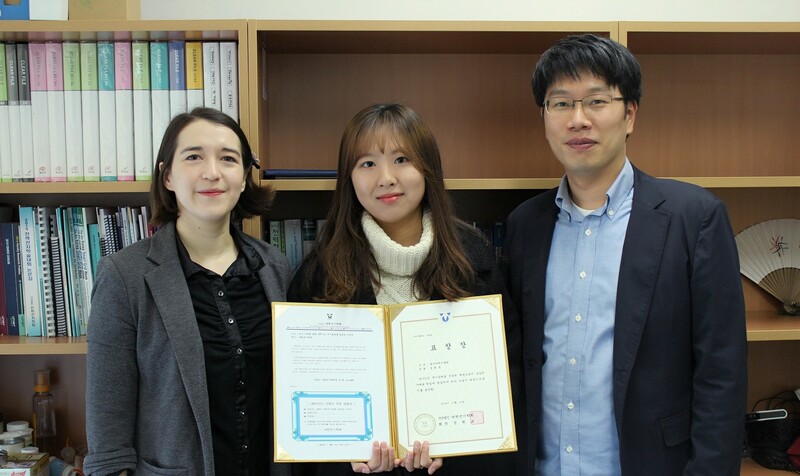 PEARS Lab undergraduate student HoeJeong Jeong received the Korean Institute of Electrical Engineers (KIEE) Best Student Award for 2016. The award was presented by Prof. Katherine A. Kim and Prof. Jeehoon Jung of the School of ECE at UNIST.